Young Bond fever is about to spread across the US again as the release of Charlie Higson's fifth novel nears. Published on May 18th, 2010, the hardback edition of "By Royal Command" will feature a departure from the regular cover artist. 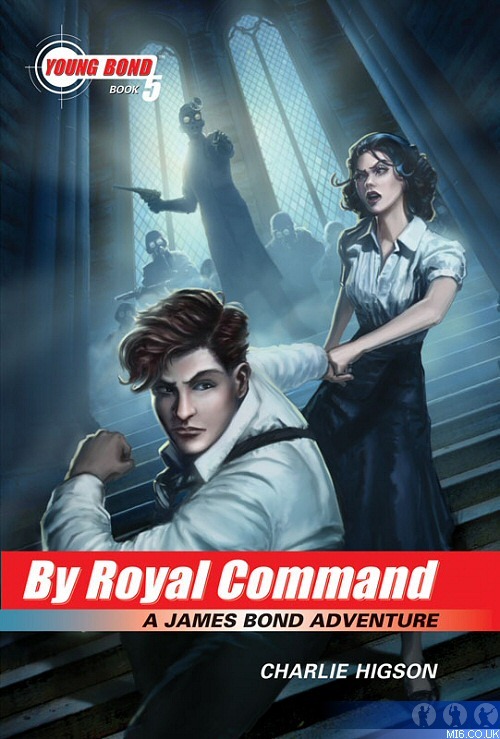 Hyperion failed to agree terms with regular Young Bond artist Kev Walker and has switched to illustrator Owen Richardson to create the "By Royal Command" hardback design. Fans of series continuity can relax though, as the design style follows the previous covers very closely. As first exclusively revealed by MI6 back in September last year, the cover features James and Roan in the hallway of Donnerspitze castle, fleeing from the menacing figure of Dr. Friend who looms in the background. Illustrator Owen Richardson will be picking up the reigns. He studied Illustration at Art Center College of Design. By day, he is a mild mannered Illustrator. He has worked in the entertainment industry as a pre-visualization and production artist, as well as illustrator of promotional and marketing support. By night, Owen dons the doublet and hose, serving on the artistic staff of the Children's Theatre of Salt Lake. He writes and directs plays for children, designs sets, paints them up and then struts and frets his hour upon the stage. Above: Full 'By Royal Command' sleeve artwork.